Highway Games has recently announced that they have exclusive agency over the premium fish hunting coin in/coin out game from IGS, Ocean King, in the United States and Europe. The machine will be made available in this month. 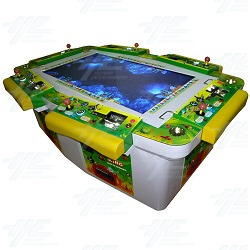 Multiplayer, fish hunting style games have proven to be of great value to operators in the amusement industry since the first video redemption, fish-catching cabinet hit the amusement market. The games have been a smash hit with players all across the globe and IGS has an extensive history of success in this area with its Fish Hunter line, which the Ocean King builds upon with all new gameplay and it’s coin in/coin out feature. The Ocean King is the biggest and most diverse cabinet in the line-up yet. With a 55 inch high resolution LCD display, superb 3D graphics on the ocean scenery, and a Deluxe cabinet with room for two extra players (8 in total), this cabinet is a must-have addition to any gaming centre or gaming area. The cabinet takes coin in (and also has a note acceptor input available as an option for operators as well) and is coin out. The seemingly simple game play concept is offset by fast, exciting gameplay that demands quick thinking, skill and co-ordination. With the Ocean King, up to 6 players can go head-to-head in a race against each other to catch as many and more profitable fish as possible to score points and get the biggest payout! The game also has a range of fun features to keep players interested, such as the new Cumulative Super Gun, which is one of three players can use, and 16 types of fish to catch with four totally new species - including the Ocean King addition, the Humpback Whale. There are also three exciting mini games including the Bomb Crab, the Twister and Chain Thunder! The mini games create more competitive gameplay by integrating with the main game and players of all ages will get hours of entertainment out of the Ocean King. Steve Josifovski, Managing Director of Highway Games stated, “We have been working closely with our customers and IGS to modify and develop Fish Hunter games to suit local market conditions, and the results have been fantastic. We have changed the win percentages, introduced thermal printer outputs and converted language to English – all of which has significantly increased returns to our customers. With great support from IGS, we continue to make changes on the Fish Hunter series, and Ocean King is the best so far”. The Ocean King is available as six player coin in and coin out cabinet or 8 player deluxe cabinet, which is coin in and thermal printer out, and is the perfect fit for gaming centres and gaming areas. For more information on the Ocean King, follow this link or please visit www.highwaygames.com. International Games System (IGS) is an amusement game company based in Taiwan which was established in 1989. IGS specializes in the design, development and manufacture of arcade game machines, and continually pursues excellence and growth in their products and business. Highway Games is an Australian company that has been involved in the arcade and amusement industry for more than 25 years, specializing in game development and distribution to over 40,000 clients in 180 different countries.